To integrate JIRA with Test Collab, you should have the URL, username and password ready that you use to access your JIRA instance. You can also use the API token generated for the user in JIRA. To generate a token access https://id.atlassian.com , API tokens option is available under "Security" tab on "Manage your account" menu. Click on "Create API token", you will be asked to provide a "Label", once you click "Create" option you will be shown the new API token. Please copy the token and keep it secured as it will not be shown again, and it is important to access your account on JIRA. 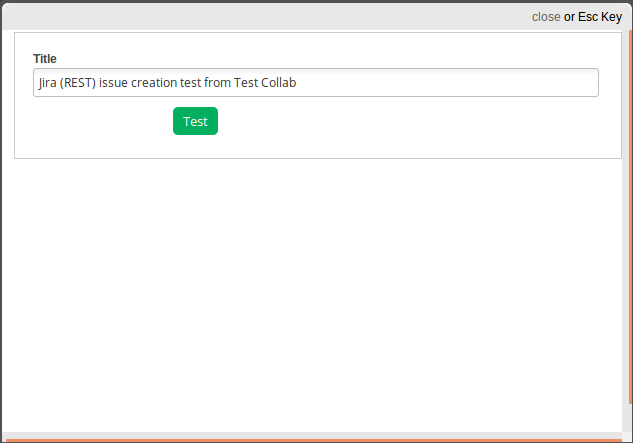 On your Test Collab instance use "Issue Manager" option under "Settings" menu on main dashboard. Select Jira (SOAP) option if you are using Jira version 4.x or older or else select Jira (REST). To use API token : User's email id should be provided as "User or API key" and API token should be provided in place of "Password"
Since the integration helps you in automatically reporting the bugs into JIRA when a test cases fails during execution and the tester has opted to report the failure; there is also an option on the global settings page that allows to automatically set the status of reported issue as resolved or closed, when the related test case passes in Test Collab in subsequent test runs. This can be done by checking "Resolve reported issues when a failed test case is marked as passed". 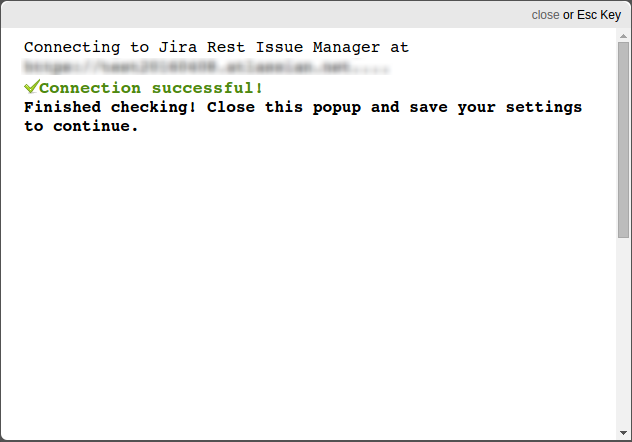 When you check this you will be prompted to provide the status code that JIRA uses for closed or resolved issues, you need to enter the same for "Status code for resolved". 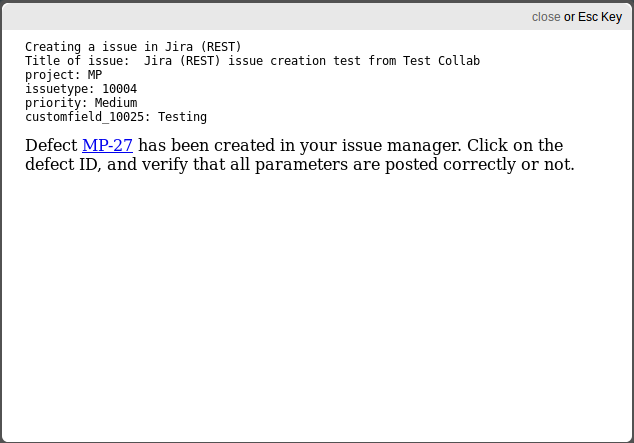 You can test the connection with your JIRA instance to check whether the settings would work or not. When clicked on "Test" you would see a window popped up to show the status of the connection. To configure project specific settings for the integrated issue manager, switch to the project and use "Issue Manager" option under "Settings" menu. project - Code of JIRA project under which you want the issues to be reported need to be entered here. assignee - Here you can specify the username of the user to whom you want to assign all issues created from Test Collab. This field is an optional field, if you will leave this field empty all bugs will be assigned to default assignee of that project. priority - You can define the priority of the issue here. Go to add issue page, and click on view source and you will see the value for priority in similar format- <option value="2" style="background-image: url(/images/icons/priority_critical.gif);" class="imagebacked">Critical</option>. So, value for critical is 2. Similarly default value for blocker is 1, major is 3, minor 4 & trivial 5.
components - You can define components here. Go to add issue page, and click on view source and you will see the value for components in similar format- <option value="10000" title="Addons ">Addons</option> So, in this case value for our component addon is 10000.
affectsVersions - You can define version in which the issue is manifesting here. Go to add issue page, and click on view source and you will see the value for versions in similar format- <option value="10000">1.0</option> So, in this case value for our affected version 1.0 is 10000.
fixVersions - You can define version to which this issue belongs here. Go to add issue page, and click on view source and you will see the value for versions in similar format- <option value="10000">1.0</option> So, in this case value for our fix version 1.0 is 10000. You can also add other fields as may be required to make the integration complete including any custom fields using "Add user defined field" from the drop down, clicking this you will get a text box in place of drop down to enter the name of the field and its desired value. 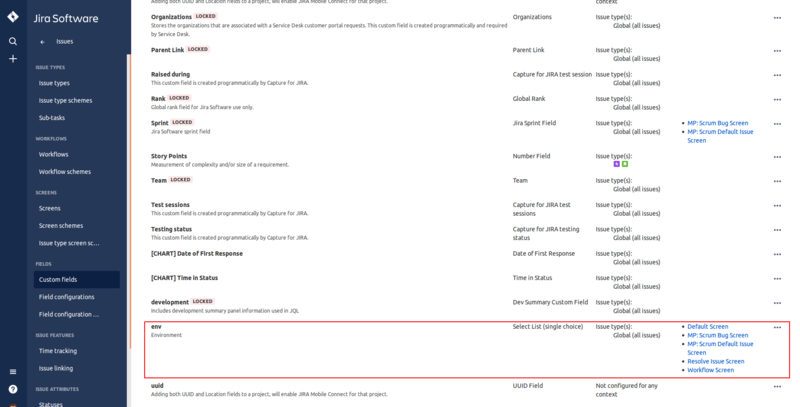 For example, if there is custom field defined on JIRA with the name "env" of select list type. Now to include this field in issue manager configuration, we need to know the id of field in use on issue add or edit form of JIRA. Note down the id used for field and also the option you want to set as value for field. A completed project specific issue manager setting form for JIRA would look like this. After the values for all fields have been provided you can save and use the "Test" button to test the settings by creating a test issue in JIRA. 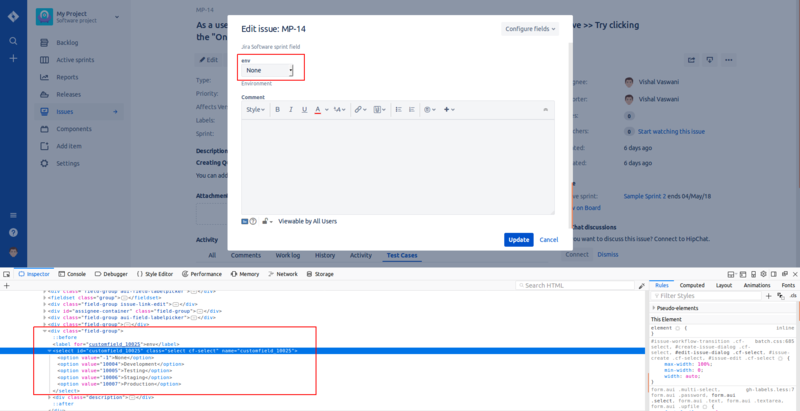 Once you have configured JIRA as an issue manager , bugs can now be automatically reported into JIRA if a test case fails while execution and the tester has opted to report. More information on this is available here. You can also get requirements from JIRA linked with test cases in Test Collab so that you can have a better traceability and coverage analysis. For details on requirements management please refer relevant article. Bi-directional integration is also possible allowing you to perform all your test case management related tasks from JIRA without any need to login to Test Collab. Please refer this article for details.